Instrumental Jazz-Rock-Fusion-Progressive music with catchy melodies and intense performing solos. 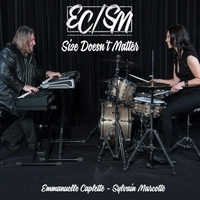 ECSM is an instrumental Jazz-Rock-Fusion-Progressive music duet founded in 2017 by Emmanuelle Caplette, drummer and Sylvain Marcotte, pianist-composer and music producer. Emmanuelle and Sylvain work together for many years in several professional and corporate contexts. They recently decided to create an original music project in which they can show and play their own music. They propose musical moments influenced by jazz, pop and progressive rock music. The catchy melodies and the very performing solos reveal breathtaking performances inspired by a exceptional complicity. Supported by technology, the duet offers a modern show with actual and original sound. EC/SM always plays music as it’s the last time they have to perform. A musical journey that you won’t forget!